The next Trinity Arts Guild meeting will be on Monday, March 4, 2019. Guest demo artist will be Donna Bland. Visitors are welcome. 2819 R. D. Hurt Parkway, Bedford, TX 76021 (inside the Boys Ranch Park). 95 pieces of art were on display. 2018 Awards approximately $2800.00 in cash and merchandise. Open to all regional artists. Entries must have been completed since January 2015. See the online prospectus and complete the online form at http://www.trinityartsguild.net. The next Trinity Arts Guild meeting will be on Monday, March 5, 2018. $1500 in awards for the Spring Member’s Show will be announcedat the Reception at 6:30 pm prior to the meeting at 7pm. The show closes on March 6. 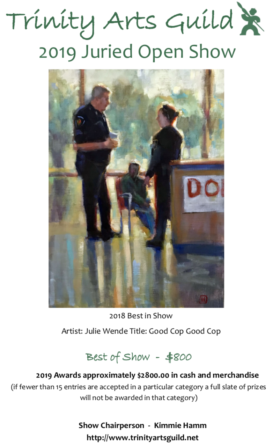 You’re invited to the Reception & Awards for the Annual Fall Members Show presented by the Trinity Arts Guild. The next Trinity Arts Guild meeting will be on Monday, November 6, 2017. Winner of the First Place Award for three dimensional art in the TAG 2017 Open Show. Guest demo artist will be Bennie Wood. 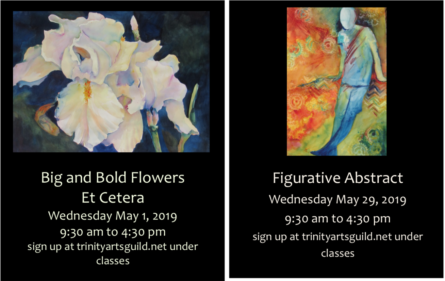 These classes are held in the Trinity Arts Guild Studio/Gallery in Bedford. Trinity Arts Guild: Meetings are held on the first Monday evening of the month (except for Labor Day.) Visitors and guests are welcome to attend our monthly meetings and demonstrations. Our next meeting will be on Monday, June 5, 2017 at 6:30 pm. In November Trinity Arts Guild merged of Mid Cities Fine Artists and will now sponsor two demonstrations per month for their members. Their normal evening meeting on the first Monday and the morning meeting on the second Wednesday of the month. Meetings are open to former mid-cities members, tag members and visitors. The 2017 Trinity Arts Guild Winter Members’ Juried Show challenge theme is “Embracing Exploration”. Up to $1,200 in prizes and cash awards. Tell Your City Story Cityscapes, buildings, bridges and structures. The Trinity Arts Guild Fall Members Show will be on display October 4, 2016 through November 8, 2016 at the TAG Gallery in Bedford. It is open to all members of Trinity Arts Guild whose dues are current, so join or renew now! Non-members may pay dues and entry fees to enter the show. The next Trinity Arts Guild meeting will be on Monday, October 3, 2016. Meetings are held on the first Monday evening of the month (except for Labor Day.) Visitors and guests are welcome to attend our monthly meetings and demonstrations.